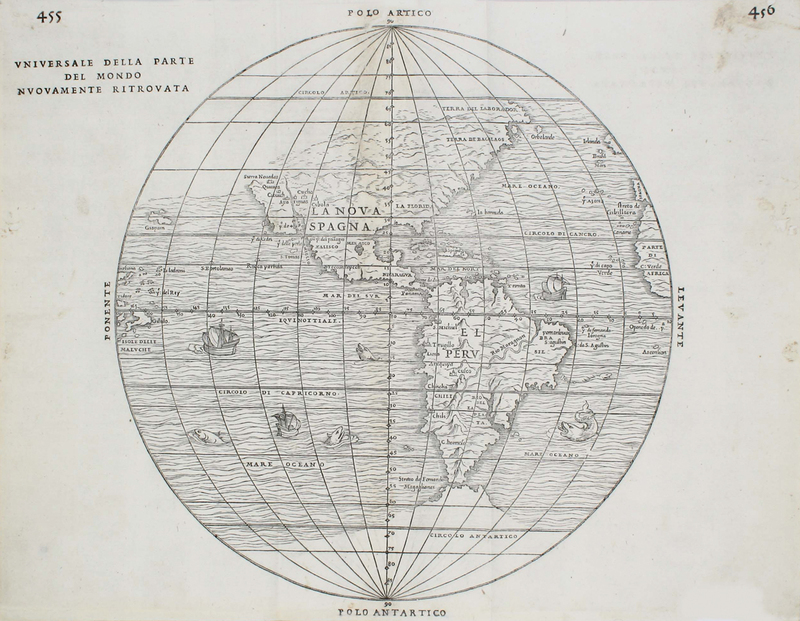 HOME > Browse > Rare Books > Landmark Books > Delle Navigationi et Viaggi. RAMUSIO, GIOVANNI BATTISTA. Delle Navigationi et Viaggi. Folio. Three volumes. 3 folding plates in Vol. I, 7 double-page maps in vol. III, numerous woodcut illustrations, maps, and plans. Vol. I title and last leaf stained and repaired, e5-6 supplied; Volume II quire H supplied. 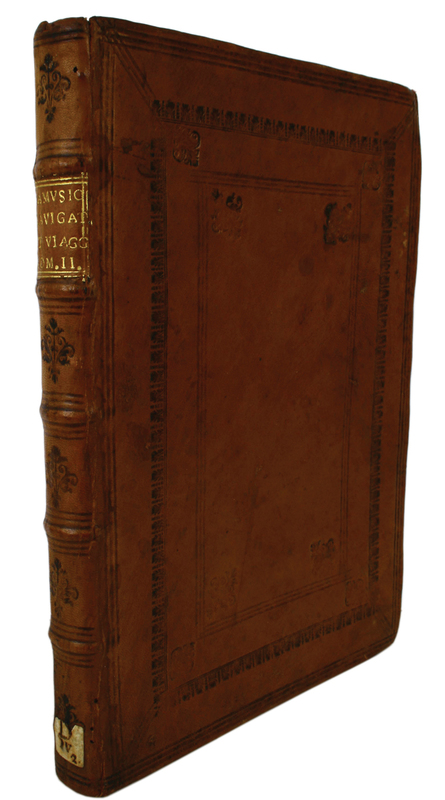 Early blind-paneled calf, minor restoration, early manuscript paper label at foot of spine. Some browning, staining, and spotting, some dampstaining, minor worming. Lower portion of Western Hemisphere map trimmed and supplied in manuscript. An especially handsome and fresh set. First editions of volumes II and II, third edition of volume I. This classic in the history of exploration includes: the first printings of the description of present-day New York by Verrazzano, the first European to see the harbor; Cartier’s account of his pioneering inland exploration of the continent; numerous maps and views of fundamental importance in the cartography of the New World; and most important, the most complete and most influential text of Marco Polo’s book of his travels. 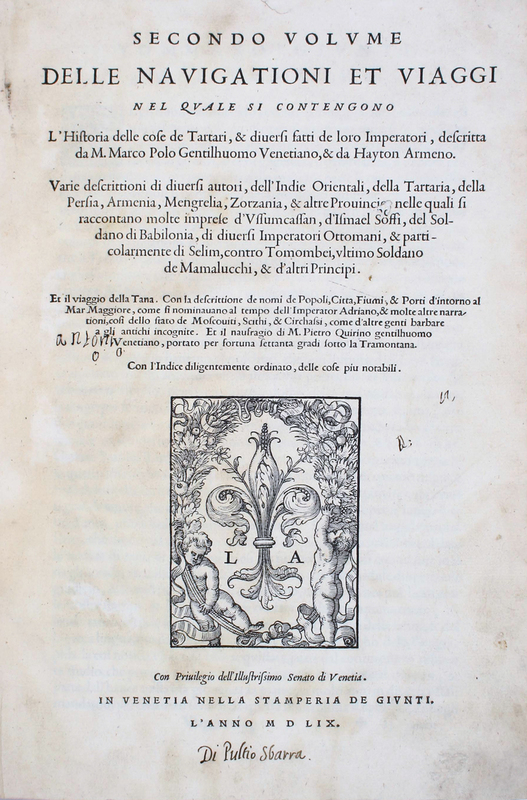 Ramusio (1485-1557), the great Venetian humanist, began corresponding with fellow humanist scholars, explorers, and travelers as early as 1525 in order to gather accounts of the Age of Exploration. 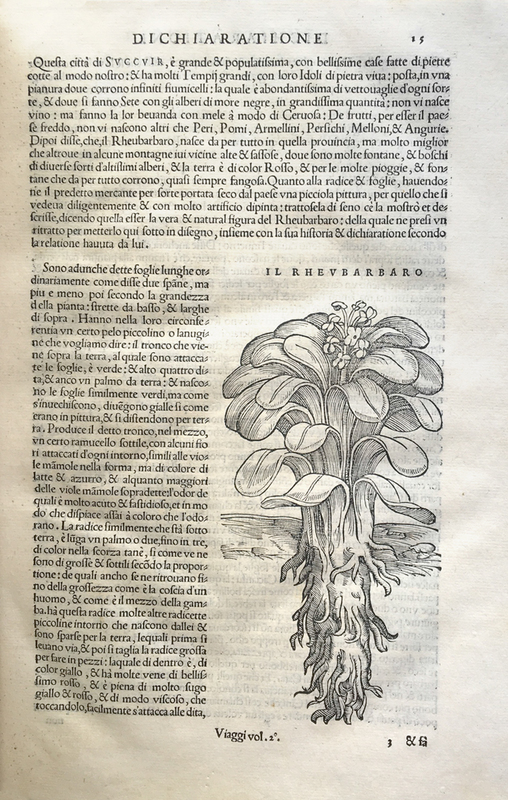 In 1548 he began to assemble the work, which was first printed in 1550 (vol. 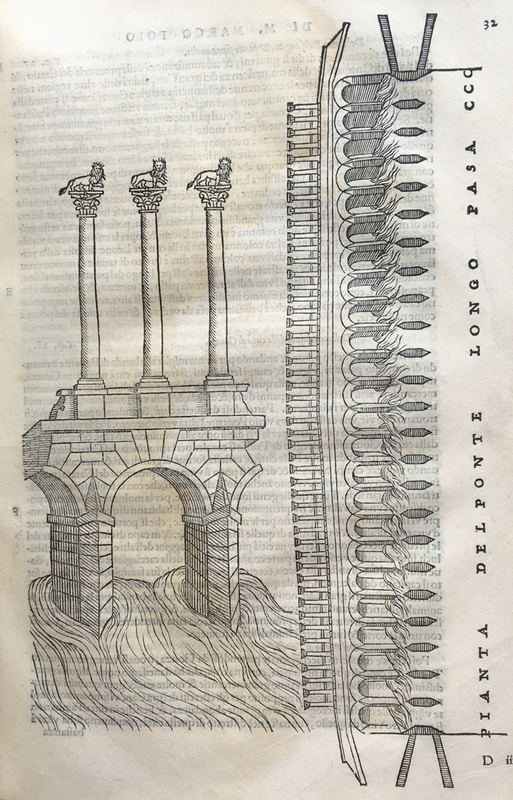 I), 1556 (vol. III) and 1559 (the delayed Vol. II). Numerous revisions and reprints followed, and Ramusio spawned countless imitators and successors such as Hakluyt, Purchas, De Bry, and others. 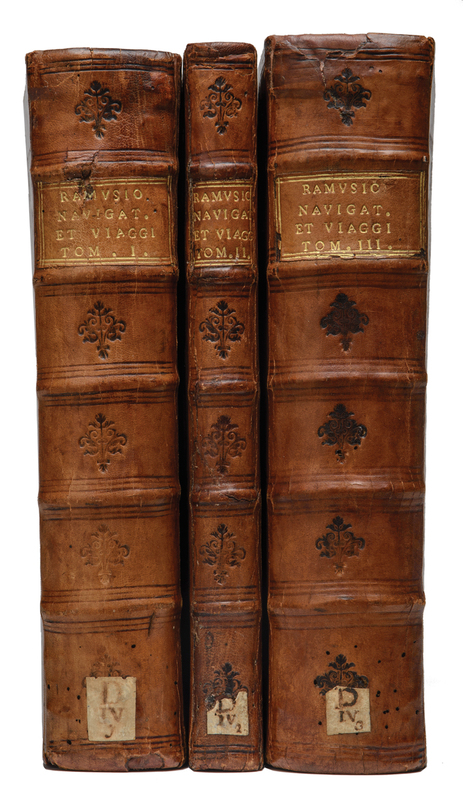 “The publication of Ramusio may be said to open an era in the literary history of Voyages and Navigation. Instead of accounts carelessly copied and translated from previous collections, perpetuating errors and anachronisms, we find in this valuable work, original narratives which betray the hand of a scholar of great critical acumen. Nor should we forget that we are indebted to Ramusio for the preservation of accounts of voyages of the utmost importance to the student of American history; and did his work contain only the ‘Relatione d’un gentilhuomo del Sig. 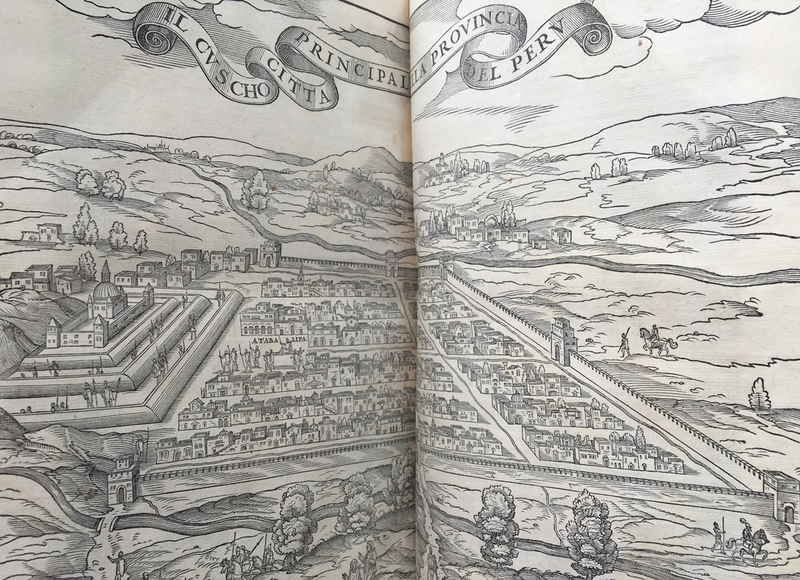 Fernando Cortese,’ and the first voyage of Jacques Cartier to Canada, the two capital relations would entitle the Raccolta to a prominent place in any American library” (Harrisse, Bibliotheca Americana Vetustissima). John Larner, in Marco Polo and the Discovery of the World (2001), summarizes: “Among the 150 surviving medieval manuscripts [of Marco Polo’s Travels], there are two distinct traditions . . . The first (A) derives from a very early Franco-Italian version, probably a copy of the original text written in French or Franco-Italian while Marco was in prison. The second (B) which, despite the sparseness of its manuscript tradition is unquestionably authentic, is found, apart from two fragments, only in the Latin version written around 1470, now in the chapter library in Toledo, in an 18th-century copy of that work, and in the Italian translation from other manuscripts by the Venetian humanist Giambattista Ramusio, published in 1559. Ramusio’s version is “of great importance, containing much material which is not to be found in the A texts (Larner)”. CARTIER. The third volume contains the first printings Jacques Cartier’s accounts of his celebrated voyages of 1534 and 1535-6 to the New World. Using the Iroquoian word for settlement (kanata), Cartier named the region Canada, which he claimed for France. In the second voyage Cartier ventured far deeper into Canada, reaching the village Hochelaga (present-day Montreal). Cartier was the first European to penetrate the North American continent from the east. VERRAZZANO. The third volume is devoted entirely to the New World. 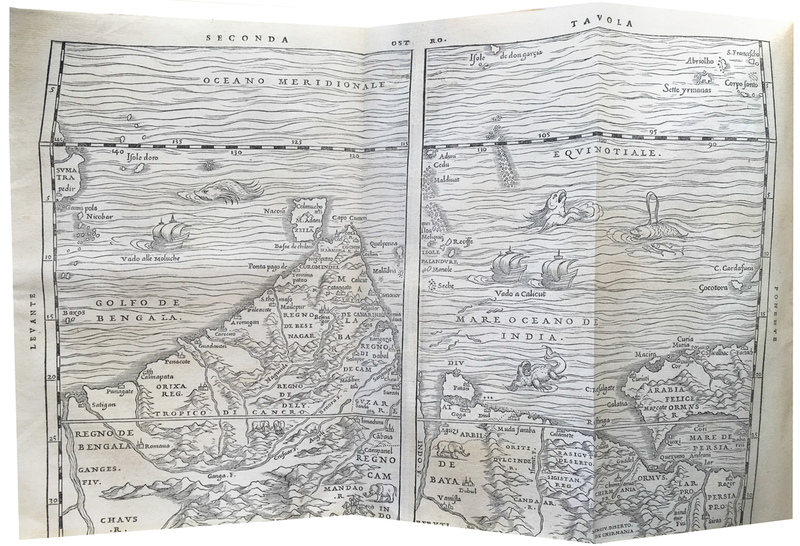 It includes the first printing of Giovanni da Verrazzano’s letter to Francois I on his famed 1524 voyage to North America. Verrazzano was the first to sail along the North American coast, showing it to be continuous from Florida to present-day Maine. Verrazzano, who surveyed the mouth of the Hudson, was the first European to see present-day New York. 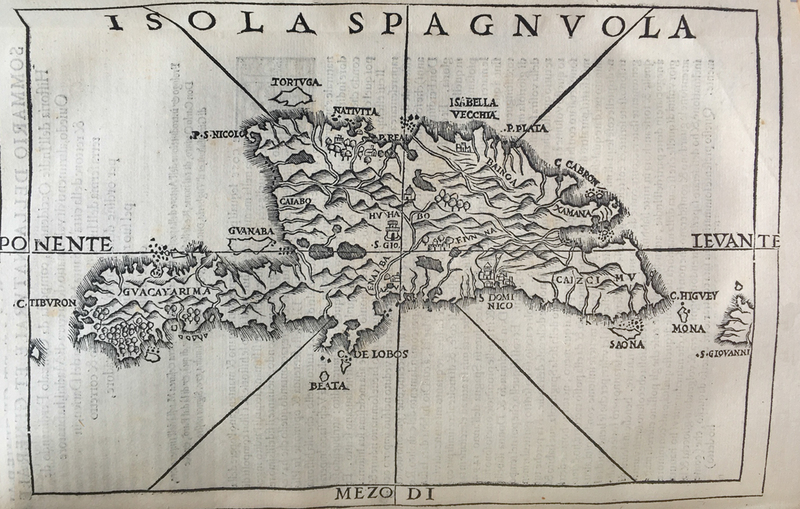 La Nuova Francia, “the first map devoted to New England and New France” (Burden 25) and the first printed map based on a firsthand account (Verrazzano’s) of New York. Hochelaga [Montreal], the first printed plan of any settlement in North America and the “earliest printed view of Montreal … showing the native village and stockades based on the information of Jacques Cartier” (Tooley). Cartier named the nearby mountain “Mont Réal” (Montreal). Tenochtitlan, or Mexico City. 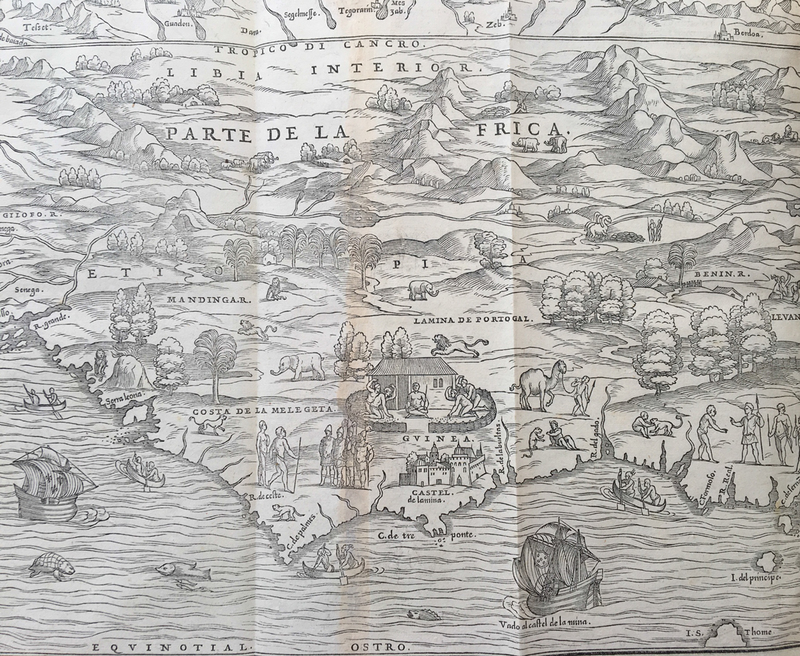 This map by Cortés, first printed in 1524, is, apart from a Columbus Letter’s view of Santo Domingo, the first printed depiction of a city in the New World. The third volume contains illustrations of curiosities of the New World such as views of Native Americans (e.g. vol. III, 68v), native houses, animals including the manatee, and flora including cacti, pineapple, and maize. Universale della Parte del Mondo Nuovamenta Ritrovata. 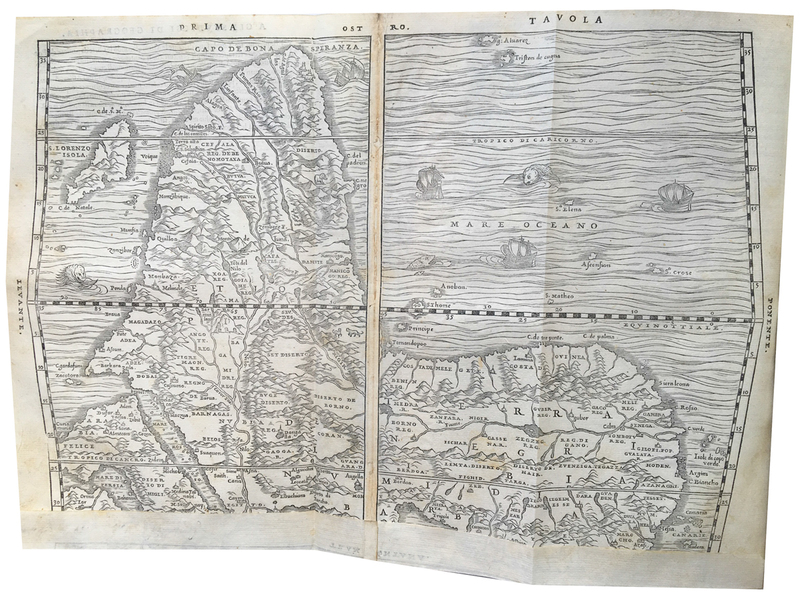 This map of the Western Hemisphere is “the first printed American map to include any of the names from the travels of Coronado of 1540-42” (Burden 24) and “the earliest cartographic reflection” of the advance of European knowledge about the American West. (Wheat). VERY RARE. Sets of Ramusio in uniform early bindings are very scarce, and examples with multiple first editions are of the greatest rarity (uniform sets with all three first editions are essentially unheard of, with none in the auction records of the past century). No other set containing two first editions and in an early binding has appeared at auction since the example sold at the Mensing sale in 1936 (second edition of vol. I and first editions of vols. II-III). Thus it has been more than 70 years since a comparable set has appeared for public sale.